Mercedes-Benz is proud to introduce you to the newest and smallest member of the growing lineup of Mercedes-Benz vehicles. All-new for 2019, the Mercedes-Benz A-Class is meticulously crafted with the proportions of a dynamic compact sedan with short front and rear overhangs which exude an aura of confidence. Power comes from an all-new 2.0-liter inline-4 turbocharged engine and 7G-DCT dual-clutch transmission for the perfect combination of efficiency and response. Inspired by technologies from the iconic Mercedes-Benz S-Class, the A-Class sets the benchmark for safety in the compact luxury sedan segment. Also a historic milestone, the all-new A-Class will be the first Mercedes-Benz model to debut with the operated MBUX – Mercedes-Benz User Experience multimedia system. Drivers and passengers alike will notice generous shoulder, elbow, and headroom in addition to simplified access to the rear of the A-Class. Engineered with practicality in mind, the trunk was designed for comfortable loading and unloading of bulky luggage or other cargo. Athletic handling and spirited acceleration are two additional benefits you’ll experience behind the wheel of the all-new Mercedes-Benz A-Class. Precision crafted while adhering to the design idiom of Sensual Purity, the stunning Mercedes-Benz A-Class stands out for its clear, formal shapes that emphasize surface areas through reduced lines and precise gaps. Available 19-inch wheels and pronounced wheel arches give the A-Class a powerful stance on the road. Other signature styling elements include a low, elongated hood, chrome slim-line headlamps, and an optional single-louvre diamond radiator grille with chrome pins. Its rear bumper can be optioned with a black diffuser or a chrome strip and tailpipe tips to match your personal styling preferences. Standard LED Headlamps with integrated LED Daytime Running Lamps provide excellent visibility of the road ahead. Offering an entirely new sense of spaciousness, the revolutionary interior of the Mercedes-Benz A-Class is primarily defined by the avant-garde design of the dashboard. A standard 7-inch or an available 10.25-inch freestanding widescreen display located in the center of the dash gives you easy access to your favorite media. Select the available ambient interior lighting to experience a total of 64 different colors comprised into ten color themes to create a lighting display with spectacular color changes. 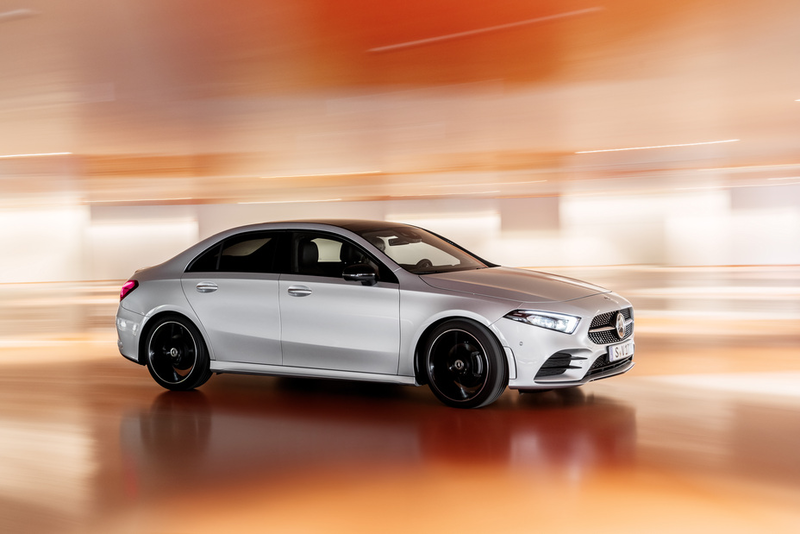 The A-Class has the honor of being the first Mercedes-Benz vehicle to launch the the completely new MBUX – the Mercedes-Benz User Experience multimedia system. A key distinction which separates this ingenious system from the ordinary is its unique ability to learn via Artificial Intelligence. MBUX offers customization which adapts to its user, forming an emotional connection between the vehicle, driver, and passengers. Stunning 3D maximum-resolution graphics are calculated and displayed in real time to deliver a truly remarkable experience. Featuring functions inspired by the iconic S-Class, the Mercedes-Benz A-Class offers the most current driver assistance technology in its segment. Using an improved camera and radar systems which allow the vehicle to see more than 1,500 feet ahead, the A-Class has the ability to drive semi-autonomously in certain conditions. Available Active Lane Keeping Assist works by alerting the driver with pulsed vibrations in the steering wheel in the event that the A-Class begins to drift out of its intended lane. PRESAFE® PLUS is able to detect an imminent rear-end collision and firmly apply the brakes in an effort to reduce the risk of a secondary collision. Included as standard, Active Brake Assist helps mitigate or avoid the consequences of rear-end collisions with slower-moving, stopping, or stationary vehicles ahead.